Nec2++ is a program for simulating antennas. It is a rewrite in C++ of an old FORTRAN code called NEC2 and has some nice features. In particular it provides a library and an API so that simulations can be done in other languages. A python module (python-necpp) has just been developed that allows you to simulate antennas using nec2++. This will download and compile the python-necpp package. NEC2 was based on punch cards and an antenna model was described as a series of Cards. These are well documented. Nec2++ replaces these cards with function calls each function call the equivalent of an nec2 card -- here's an example. We'll model a vertical monopole (like a whip antenna on an old radio). The transmission coefficient is (1.0 - Gamma) and represents how much of the original signal makes it through this junction. Imagine the antenna is fixed 0.5 meters above the ground and we are connecting the signal to the antenna one-third of the way along its length. How long should the wire be for optimum performance? If we minimize the reflection coefficient, this is a relatively easy optimization. 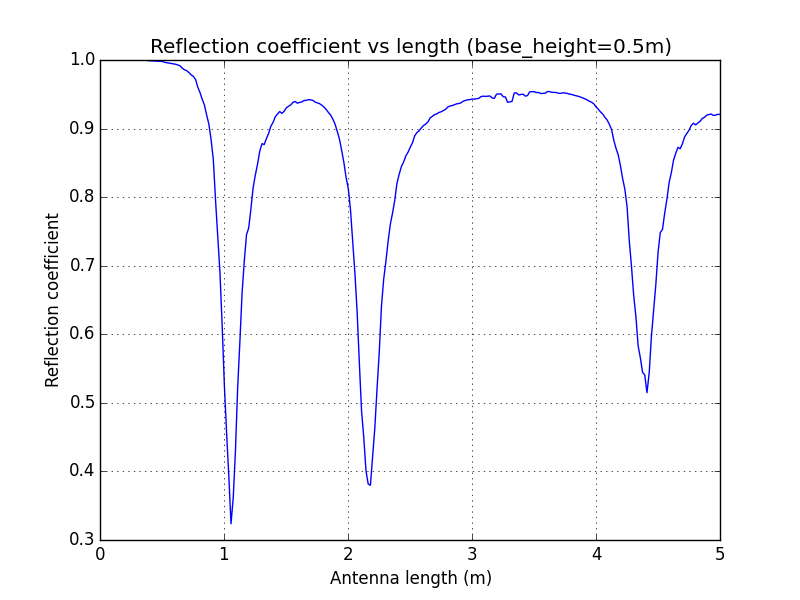 We can use matplotlib to plot the reflection coefficient as a function of length, with the base_height of the antenna fixed. The reflection coefficient has several minima when the base height is 0.5m. The first occurs when the antenna length is just over 1m. This shows that for short lengths, less than 10 percent of the signal makes it through. There is a local minimum (of approximately 0.3) that occurs around 1.1m for which around 70 percent of the signal makes it through. In another post I'll show how to use python-necpp and matplotlib to automatically design a vehicle antenna. Source code for this example on github. When i try to run this code on Lubuntu 14.04, it drops an error "NameError: global name 'nec_create' is not defined", i tried others codes from GitHub and got the same result, any suggest?, I installed the package necpp, and python-necpp from synaptic. The link to http://www.nec2.org/part_3/cards/toc.html is not very useful, as all the links on that page are broken. This code is written in python2 style. Is python3 supported?